Arts and cultural organizations have voiced their fears of changing socioeconomic standards on the island, and laid out a plan to maintain the public space in the face of gentrification. 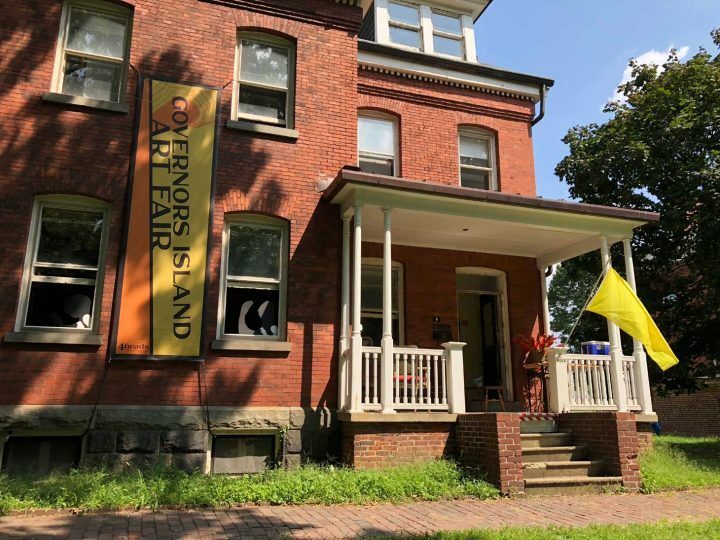 On Wednesday, September 26, a group of 14 independent arts and cultural organizations working on Governors Island voiced their concerns about the island’s future in a meeting about the proposed rezoning. 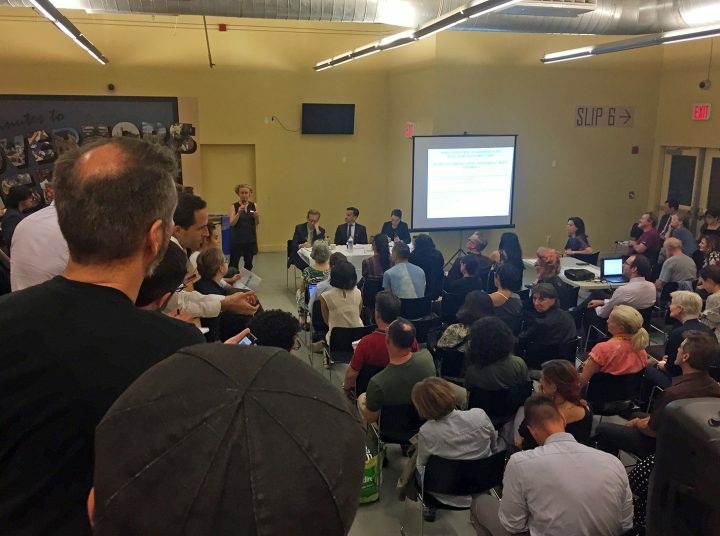 Concerned city residents attended the event to voice their hesitancies about the luxury developments the city has in store for the haven in New York Harbor. Mayor Bill de Blasio recently opened a public review process to rezone 4.5 million square feet on the island for boutique hotels, luxury “glamping,” and a “cool” convention site. Currently, many of the 52 historic buildings on the 172-acre island remain empty, but the site is a haven for artists, rife with studio space and room for art fairs and organizations to spread out. … the rezoning proposal is just for the South Island development zones, not the historic district where the spa is anticipated (that is a deal that dates back to 2012, pre this proposal). The rezoning proposal is to allow education, cultural, research, office and some hospitality uses in the South Island. Currently those uses are not allowed – that portion of the Island is zoned for housing, and permanent housing is not permitted as part of our deed. The historic district was rezoned in 2013 to allow for the cultural uses and educational uses we have there today, and we are looking to extend that to the Southern portion. The rezoning proposal does not list “luxury development” — the idea is for an educational institution to anchor the space. Their initial rezoning announcement can be read in its entirety here. Nelson says for years artists built their cultural community without basic amenities, like running water. The luxury rezoning will radically change the island, and likely push out the artists who have called it home for many years. The island has seen significant changes already as more New Yorkers and tourists take note of the former military base. TheNew York Times reported that in the summer in 2005, only 8,000 people visited the island, but in the past year, around 800,000 visitors passed through. “Sometimes artists don’t have as big of a voice as the people who want a piece of it,” Nelson said, explaining that the organizations showed up at the rezoning meeting not to protest, but to ensure their voices were heard. The rezoning is being led by the president of the Trust for Governors Island Michael Samuelian, a real estate developer, who was present on the meeting’s panel. Since opening to the public in 2005, the arts have played and continue to play a pivotal role in serving and growing Governors Island’s audience with programming from independent organizations across NYC. The Trust is proud to host organizations and free public events that return to the island year after year. With a longer season, we’ve prioritized furthering our commitment to providing opportunities for organizations to utilize the Island as a platform for exhibitions, performances, workshops, artist residencies and events, increasing and diversifying the number of organizations working in free or low cost space. Looking ahead, we’re anchoring our commitment to maintaining Governors Island as a citywide resource for art, culture and education. We look forward to engaging our community and hearing ideas as the Island continues to transform. “My biggest hope is accessibility,” Lori Nelson says. She says she knows change is inevitable but wants to ensure artists are not pushed out, and access to the Islands’ resources are not gatekept and refused to low-income residents who have been integral to the area throughout the past decade. We are a group of 14 independent arts and cultural presenting organizations working on Governors Island who have come together to speak with one voice. Some of us have been working on the island for as long as 12 years and we would like to participate in the planning of its future as a cultural destination. As the pace of development on the Island accelerates, it is our sincere hope that existing and legacy organizations will have an active role in the process. The growing success of Governors Island has been the result of an important collaborative process between the City of New York, the Trust for Governors Island, and the groups responsible for the diverse variety of cultural programming on the island. Community-based programming is what engages New Yorkers and draws new visitors to Governors Island. This type of activity is not something that can be manufactured or imitated, and it is exactly this local culture that will draw interest from innovative corporate entities who want to align themselves with an authentic New York art scene. Our programming has helped grow the island’s annual attendance from under 50,000 visits in the 2007 season, to nearly 800,000 in 2017 – a 1600% increase. Former Trust for Governors Island President, Leslie Koch, called it “the new arts playground for the people of New York City”. The New York Times, New York Post, Daily News, Art News, Time Out, NY 1, ABC, and so many other major media outlets, have heralded our work on Governors Island, cementing our joint status as an arts destination. As arts and cultural presenters who have been investing here for over a decade, we understand it is imperative for the island to support itself financially. We would like to stand with this rezoning initiative for the continued growth of the island as an important destination for arts and recreation in New York City. 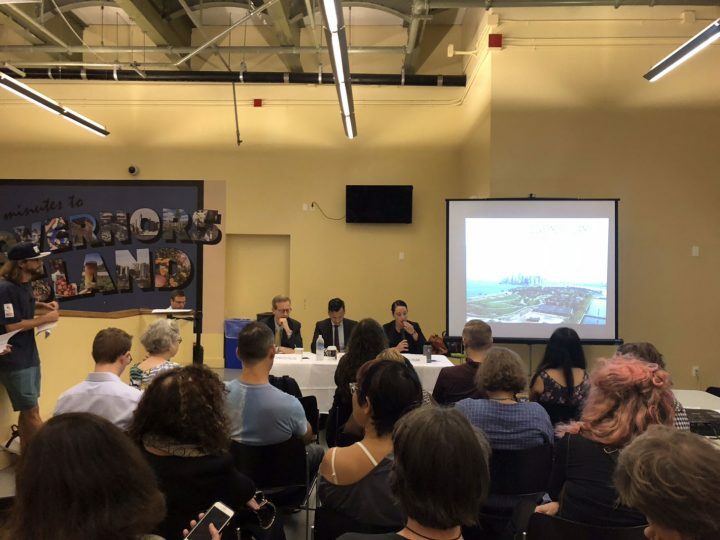 However, we are sincerely concerned about the increasing commercialization of Governors Island, and that this rezoning will create an environment in which community-based arts and culture will inevitably suffer and fade, to be replaced by more commercially oriented, and inherently less-inclusive activity. We believe that, given a seat at the table, our organizations could help develop and maintain a clear, sustainable vision for arts and culture on Governors Island. It is our collective goal to preserve the vision of arts created of, by, and for the people of New York City. What is the cultural strategy for Governors Island that defines its mission in alignment with the 2003 deed, preserving the island as a place for the people of New York to enjoy a diversity of arts experiences? Several not-for-profit organizations rely on their use of space on Governors Island to further their respective charitable programs. How do you intend to work with these organizations during the rezoning and re-development processes? Without a real commitment from the Island, not-for-profit organizations do not have adequate time to fundraise, and are essentially unable to form relationships with many funders. Will multiple year commitments be offered from the Island to its accepted and long-standing arts partners? As cultural presenters, we would like more information regarding the decision making process and request that there be better communication and transparency throughout. Will there be a place for representation by existing arts and cultural partners at all levels of island oversight? Will there be a more diverse panel appointed to review arts and cultural proposals, including members of the existing cultural community? Page 10 of the Draft Scope of Work states that “The proposed density of development is needed to create a critical mass of active uses that would… support the maintenance of the Island’s open space and landscapes as well as the historic buildings on the North Island.” Can you please provide additional detail on this, including how funds will be allocated and the process by which such allocation will be determined? We understand that the island must approve permits based on a previously determined set of standards, but we hope that the ability to pay rent is not the primary determinant. What is the Percent for the Arts model that the island has or will have in place to support community-based arts organizations? Will a fund be established to provide for smaller cultural organizations to continue operating on the island? Will parts of the South Island also be slated for arts and culture? Will access to the various venues and resources on Governors Island be provided for existing arts groups? In the Activation Strategy, it states that most of Colonels Row and all of Nolan Park are slated for cultural use. In this context, can you define “cultural use”? The Draft Scope of Work references a “full re-tenanting” of the North Island. Can you please explain what is meant by this? Will these buildings remain open to proposals for arts programmers? We understand TGI’s desire to enact a leasing model; what are the details of this model? We advocate for accessibility to small or budding arts organizations that might not have the budgets to compete with larger, more established cultural organizations. Will the socio-economic analysis assess current programming on the island, the types of populations it attracts, and whether these demographics are likely to change as a result of new development? What steps will be taken to ensure that new businesses will not displace arts programs or cultural institutions, directly or indirectly? It is our understanding that the Island does not currently have any residents. In connection with the Second Supplemental Generic Environmental Impact Statement (SSGEIS), how will you define the “relevant community” in order to determine the impact on such community? Will the island’s Cultural Programmers be included in the study? With respect to both the Mixed Use option and the University Research option, do you anticipate that any currently-existing public benefit uses on the Island will be displaced? If so, will the SSGEIS analyze such displacement? Do you have any current plans as to how such displacement will be managed? This is a pivotal moment for Governors Island. We have collectively spent many years working in partnership with the Trust, the Friends of Governors Island, the City, and the National Park Service, to develop the cultural identity of the island. And now, together, we have before us an incredible opportunity to build on our recognition and success to develop this unique space into an exceptional cultural destination that can generate the revenue it needs to support itself. But arts and real estate interests must work together to achieve this. Vital cultural communities everywhere have been decimated by short-sighted, fast-paced development that moves forward without the oversight of cultural preservation. We all know the story; art paves the way and commercial interests pave over the art. The topic of gentrification and the demise of cultural communities is of great concern to all New Yorkers, and is continually discussed in the media. Now is an opportunity for the City to ensure that Governors Island winds up on the right side of history, and becomes a shining example of how to develop public space, with a strong focus on community and cultural preservation. Although Governors Island is a great venue for leisure activities, people do not visit the island only for leisure and commercial experiences. They also come in search of the cultural experience that the City of New York promised to its people. Governors Island has shown itself to be a place where programs are organized by – and reflective of – the cultural and artistic diversity of our city. And there is an important distinction between large-scale arts institutions within the industry establishment, and locally based arts organizations that the community has grown to know, appreciate, look to, and connect with on a personal level. We are standing up together for the preservation of this community and we ask you to join us. We would like the opportunity to work as a team to maintain a sense of cultural priority and balance, for the common good of our great city. Thank you very much for your attention and support.